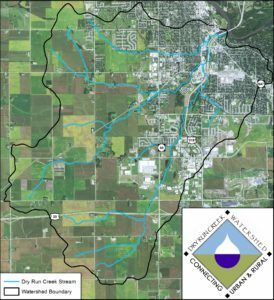 Dry Run Creek is a 15,177 acre watershed which flows from the agricultural lands of Black Hawk county through residential, industrial, and commercial areas including the city of Cedar Falls and the University of Northern Iowa before outletting in to the Cedar River. In 2002, a segment of the southwest branch was listed on Iowa’s 303(d) list of impaired waters due to a lack of diversity and abundance of aquatic life. In 2008, the creek received a second impairment designation when it was placed on the 303(d) list for bacterial impairment. Because the watershed is impaired, it is eligible for state and federal funding to improve it. The focus of the project is to address both of these impairments and to improve water quality in both rural and urban sectors of the watershed. The three major components of the watershed are project installation, water monitoring, as well as outreach and education. Dry Run Creek is a dynamic watershed with varied land use. Currently about 44% of the watershed is designated as urban with the remaining 56% identified as rural. It is estimated that there is a 1% increase in urban development throughout the watershed each year. Demonstrating partnerships between both urban and rural landowners is a major focus of the project. For information on how you can get involved with the project and improve water quality in our community, please contact us. Want to know if you live within the Dry Run Creek watershed and are eligible for cost share dollars? Type in your address on this interactive map Dry Run Creek Google Map. This map was created in partnership with the Cedar Falls CAPS program.